Today, we are proud to announce that we are turning on encryption of worker nodes by default. Many internal teams and external customers asked us for encrypted data volumes on worker nodes, and we listened to you! As of today, this change makes your data in new clusters and workers that you create even more secure by default. IBM Cloud Container Service provides encrypted data partitions for all worker nodes by provisioning them with two local SSD partitions. The first boot partition is not encrypted, and the second partition mounted to /var/lib/docker is unlocked at boot time by using LUKS encryption keys. Each worker in each Kubernetes cluster has its own unique LUKS encryption key, managed by the IBM Cloud Container Service. At boot time, they are pulled securely and then discarded after the encrypted disk is unlocked. You might find that some workloads with high-performance disk I/O requirements are impacted when encrypted. In some of our encrypted performance tests, we saw single-digit percentage disk I/O impact, but in most there was no impact. If you have performance-sensitive workloads, you might want to do benchmarks tests with both encryption-enabled and disabled to help you decide if you want to turn off encryption. From the IBM Cloud console GUI, encryption is already turned on for you. If you want to turn off encryption, clear the Encrypt local disk check box (see below) when you create a cluster or add a worker to an existing cluster. 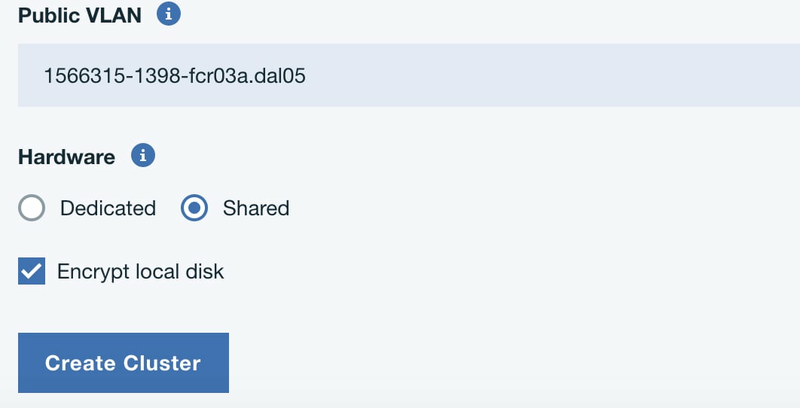 Now, encryption is turned on by default when you create a cluster or add a worker to an existing cluster! If you want to disable encryption, specify the --disable-disk-encrypt option when using the cluster-create or the worker-add commands. Please join us on our public Slack channel at https://ibm-container-service.slack.com.